1) Coffee Oreo milkshake $5 - This came after we almost finished our desserts. It had quite an icy taste, very refreshing and cold. 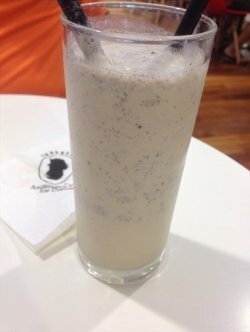 This milkshake is made up of 2 scoops of latte icecream and 1 scoop of cookies & cream icecream. 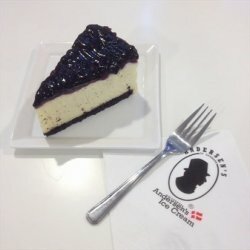 2) Blueberry cheese cake $5.20 - This tasted not bad. The cheese taste was rather strong while the blueberry taste was lacking. The texture was sufficiently moist. 3) Happie brownie $14.50 - one piece of thin brownie sliced into half (so they were 2 slices on the plate) with 1 scoop of whipped cream and 2 mini scoops of icecream. 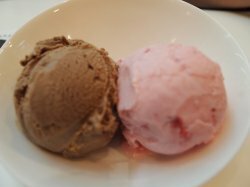 We chose banana crunch and forest berry flavours for the ice-cream which were good but there was a lack of banana flavour for the banana icecream. Scoop of icecream could be larger to make it more enjoyable. The chocolate dip served at the side was too thick and dry and wasn't warm too which I believe would have tasted better if it was something like warm chocolate fudge. 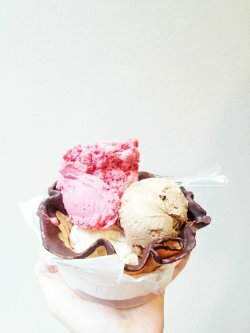 Ordered 3 scoops of ice-cream on a waffle bowl. The waffle bowl was quite disappointing as there was no crunch factor in it and the taste was rather mediocre. Good thing about it was that it wasn't sweet. The ice-cream flavours were rum and raisin which was not bad, raspberry sorbey which was very refreshing and unique and mocha almond fudge (favourite among the three). The staff seemed quite impatient with us when we were ordering. Price: $9.80 for takeaway. 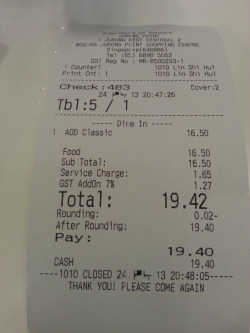 For eat-in, it actually costs $19+ which I find it really ridiculous even if you add in the cost of service charge and GST. Ordered the Couple Fondue for a friend's birthday. We were allowed to choose 5 ice cream flavours of our choice like Belgian Chocolate Chip, Cookies and Cream and Rum and Raisins etc. 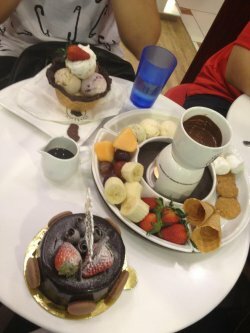 It came with warm chocolate (of course), slices of fruits and waffles and cookies and mashmallows.The portion was a bit small to be shared among four people but then it's meant to be couple fondue so I guess it's okay. Overall the ice cream were good and I love the warm chocolate! Ordered the Couple Fondue for a friend's birthday. We were allowed to choose 5 ice cream flavours of our choice like Belgian Chocolate Chip, Cookies and Cream and Rum and Raisins etc. It came with warm chocolate (of course), slices of fruits and waffles and cookies and mashmallows. The portion was a bit small to be shared among four people but then it's meant to be couple fondue so I guess it's okay. Overall the ice cream were good and I love the warm chocolate! Normally when my mood is really low and wanted something to really cheer me up, the waffle basket ice cream from Anderson will normally be my favourite choice. The waffle biscuit is very crunchy and full with the butter flavour and nice fragrant. Like the layers of dark chocolate coating on it which also enhance the taste of the waffle. 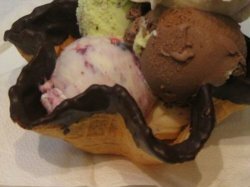 Not to forget their signature wide range of ice cream which are certainly delicious and the scoop is quite generous as well. The anderson ice cream is nice, chewy and chilling. 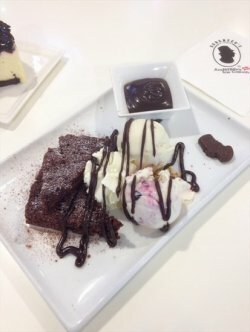 I had their ice cream because I bought a Cadbury chocolate bar which gives a voucher of anderson ice cream $2 instead of $5. There are a lot of flavours to choose from, the special one is madacamia nuts which is the one I ordered. I prefer to eat in the cup and not the waffle cup. But anyway, the waffle cup is crispy as I can hear my friend biting the waffle cone with crunchy sound. The ice cream is very chewy and not easily melted. 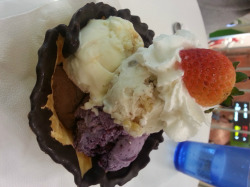 And the portion is quite large for one scoop as compare to other shops. This chocolate fondue from Anderson looks really nice in presentation and taste is equally nice as well. 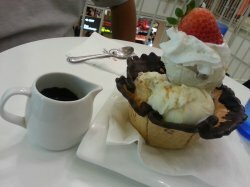 They have used dark chocolate to use as their chocolate sauce for dipping the mashmallows and fruits. The cut fruits which includes melons, watermelons and strawberries. 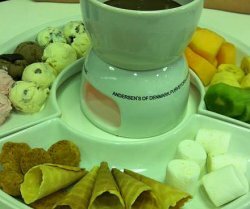 The special parts about this chocolate fondue is that they also includes ice cream cone waffles and scoopes of ice creams on their displayed tray too. The portion is just alright for a couple and great to have it with a cup of hot beverage as well. 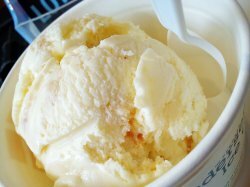 ice cream can be found everywhere, from supermarkets to mini marts at ur house downstairs to shopping malls. i personally enjoy occasionally treating myself to some delicious ice cream from time to time. 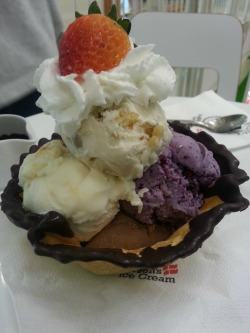 andersen's ice cream is somewhat different from the kinds that u buy of the shelf. 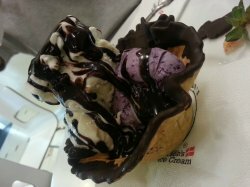 the ice cream is exceptionally creamy and rich and the waffle cone is crunchy and very fragrant. however, the branch at JP have very little seating areas, and mostly are filled up during the weekends and holidays. ice cream can be found everywhere, from supermarkets to mini marts at ur house downstairs to shopping malls. i personally enjoy occasionally treating myself to some delicious ice cream from time to time. 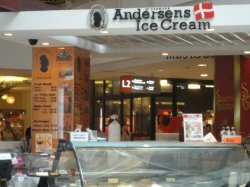 andersen's ice cream is somewhat different from the kinds that u buy of the shelf. 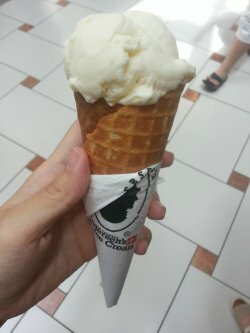 the ice cream is exceptionally creamy and rich and the waffle cone is crunchy and very fragrant. 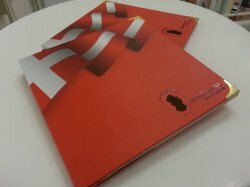 however, the branch at JP have very little seating areas, and mostly are filled up during the weekends and holidays. 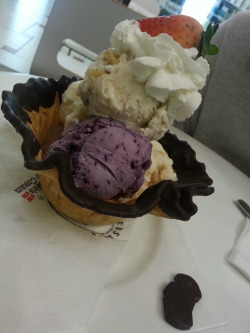 so the best time to enjoy the ice cream on weekdays when everyone is busy at school or work.